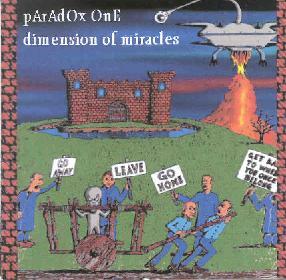 Paradox One - "Dimension Of Miracles"
My introduction to Paradox One (the moniker used by Scottish progressive rock musician Phil Jackson) was the debut Reality Quake CD (see AI #15). An impressive set of epic keyboard driven prog rock, my only complaint about the album was that it burdened itself with more ideas than it could properly develop and had some technical trouble with the transitions between themes. But despite these criticisms it was clear that Phil was on to something. And when I first played the latest Paradox One release, Dimension Of Miracles, I had a suspicion that I'd be in for a pleasant surprise.... and indeed I was. The title track is a 3-part piece that opens with sequenced keyboards against a spacey symphonic backdrop which serves as a slow buildup. The music soon launches into an ELP styled prog rocker with great melodies and some skillful electronic percussion... it thankfully lacks the cold mechanical feel that electro percussion often has. "From The Void" begins as a jazz-rock piece, but more prog than fusion influenced. Soon the sympho keyboards kick in while the toe-tapping jazzy bits continue. I dig the fuzzed keyboard that serves a bass function and we're also treated to a luscious early 70's jamming keyboard sound. An excellent track. "Tragic Realm" is another 3-part work. A dark haunted house feel pervades the atmospheric intro, followed by a majestic organ segment (coincidentally titled "Majesty"). More heavy keyboards and intricately developed progressive rock in the ELP vein makes up the main theme. Though Paradox One travel in predominantly progressive realms, there's plenty of spacey atmospherics and even some overt space rock influences as well. For example, I'll call "Alien Harvest" progressive space rock. Imagine ultra-spaced out ELP (Keith Emerson jamming with Hawkwind?) and you'll get something like this atmospheric and ultimately tripped out heavy driving track. "The Road To Osiris" doesn't flow smoothly during the first few minutes but it's another meeting of cosmic space rock and prog. One section even reminds me of a more symphonic version of Hawkwind's "Love In Space". "Quarter's Mass Final Movement" is a similar track that space rockers will like. "Big Brother" is a track that's a little different. It's a little uneven in terms of the intro and the main theme, but ends up being the most balls out rockin' track on the CD. Something of a jamming space garage tune with a bit of an angry punk feel. Overall I'd say Jackson is developing the Paradox One project nicely and space rock fans who have a taste for keyboard dominated progressive rock will find much to enjoy on this album. For more information you can visit the Paradox One web site at: http://www.paradoxone.co.uk. Dimension Of Miracles is distributed by Neurosis Records. You can visit their web site at: http://communities.msn.com/GuitaristRickRay.